DISGUSTING: Biggenden bush walking guide Moira Thompson was greeted by soiled nappies and smashed beer bottles when she went to Waterfall Creek at Utopia. Contributed. 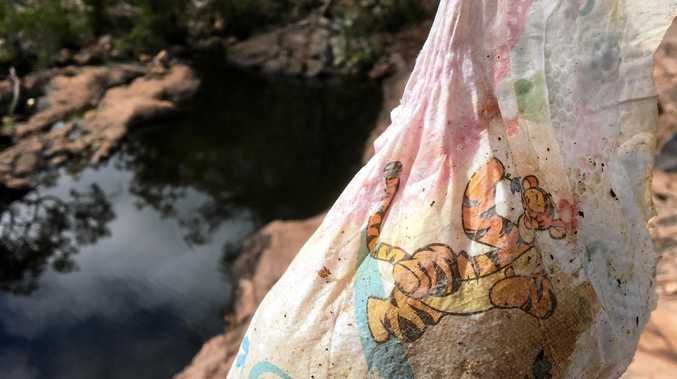 LAST week bush-walking guide Moira Thompson couldn't believe her eyes with the rubbish she was greeted with when she visited the rock pools at Utopia. She had planned to do a short bush walk to explore some country near Waterfall Creek rock pools at the Utopia end of the Mt Walsh National Park. Mrs Thompson said from past experience she thought it best to take a rubbish bag. "I was so surprised and annoyed at what I found,” she said. Mrs Thompson said some of the sanitary items were beside the rockpools. "To say I was boiling mad would be an understatement,” she said. "I was furious and fed up with picking up such rubbish. "When it rains this all flows into the rock pools. When Mrs Thompson arrived at the rock pools there wasn't anyone there. "Two hours later, on return, four young people were sitting beside the pools, one already seemed inebriated. "Walking down past the last big pool I found four smashed beer bottles with fresh ice,” she said. Mrs Thompson has sent a full report to QPWS.